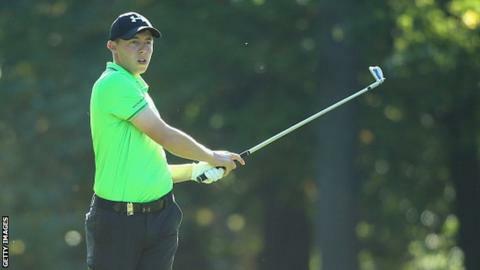 England's Matthew Fitzpatrick is joint leader of the British Masters with Denmark's Soren Kjeldsen after a solid second round at Woburn. The 21-year-old was the overnight leader and added a 69 to his opening 64 to finish Friday at nine under. Kjeldsen, 40, joined Fitzpatrick at the top of the leaderboard after he made 68 following his opening round of 65. The duo are one shot clear of England's Richard Bland and Thailand's Kiradech Aphibarnrat in the chasing pack. Fitzpatrick is in his first full season on the European Tour and searching for his first title. The 2013 US Amateur champion from Sheffield, ranked 111th in the world, admits he will not put himself under any undue pressure heading into the weekend. "I'm just playing one hole, one round at a time," Fitzpatrick said. "If the win doesn't come this week but I move up in the world rankings that's good enough for me, so if I can just keep moving up slowly that will be great." Irishman Shane Lowry remains in contention and ended the day two shots off the lead with while tournament host Ian Poulter finished five shots behind on a four under. Poulter suffered a complete mis-hit at the fifth that led to a double-bogey six, but believes he can force his way back into contention. He said: "I'm on my home course and I know it well. "Five shots back is very achievable on this course, the way I know these greens."